This class can have analyses registered with it and when run, it will run all of them and aggregate their results into single AA results interface that dispatches across all of the alias analysis results available. Note that the order in which analyses are registered is very significant. That is the order in which the results will be aggregated and queried. This manager effectively wraps the AnalysisManager for registering alias analyses. 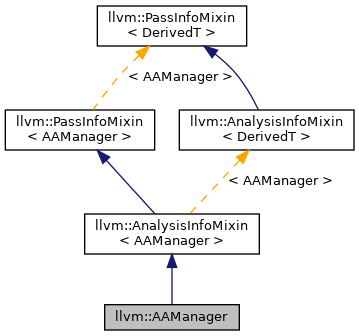 When you register your alias analysis with this manager, it will ensure the analysis itself is registered with its AnalysisManager. Definition at line 1099 of file AliasAnalysis.h. Definition at line 1101 of file AliasAnalysis.h. Definition at line 1104 of file AliasAnalysis.h. Definition at line 1109 of file AliasAnalysis.h. Definition at line 1113 of file AliasAnalysis.h. References llvm::AAResults::addAADependencyID(), llvm::AAResults::addAAResult(), F(), llvm::GlobalValue::getParent(), and llvm::AnalysisManager< IRUnitT, ExtraArgTs >::getResult().